Executive chairman Peter Cowgill told the BBC: "The business has stayed very much in tune with the millennials and Generation Z. "This is in terms of providing customer experience and customer focus." He added: "We are pleased with the continued underlying positive performance of the group and are excited by the major developments ahead." In the past few weeks, JD has rescued Liam Gallagher's fashion brand Pretty Green from administration and made a £90.1m offer to buy clothing and shoe retailer Footasylum. He added: "Despite the challenging conditions on the High Street, retailers who continue to thrive are those that have embraced change, invested in digital and listened to their customers to keep products fresh and desirable." Julie Palmer, partner at Begbies Traynor, said that JD was making the most of "the current trainer trend among millennials". 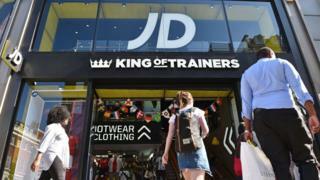 She added: "JD Sports must stay on the front foot and continue to offer a unique customer experience with competitive pricing in order to keep momentum and drive footfall into stores. Other retailers should take note and follow its lead or risk getting caught in the current and dragged under." Jane Sydenham, investment director at Rathbones, told the BBC's Wake Up To Money programme: "They're really focusing on their brands and making sure they have a tight focus on their products and really responding to what their customers actually want. "So they're not just trying to have as broad a range of products as possible at the cheapest price."